With our beautiful Larado Bed as the center of your suite, you're sure to say "wow" every time you enter your bedroom. 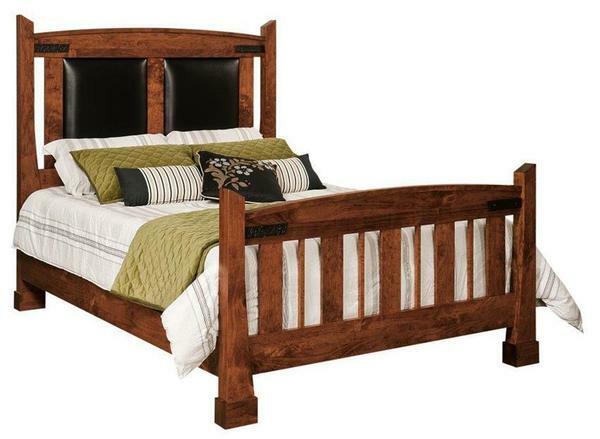 Crafted by the hands of skilled Amish artisans that hold generations of woodwork knowledge, this gorgeous bed is made for a lifetime of service and has enough integrity to serve as a beautiful keepsake for generations to come. The classic Mission-Shaker style of the Larado Collection will lend itself nicely to a variety of decor. The bold design offers a rustic charm that pairs nicely with the natural grain patterns that come alive in the solid hardwood, ensuring a quiet warmth to any bedroom it graces. The beautiful panel headboard can be customized with leather panels or solid wood, and is framed with beautiful curves from the top trim and solid legs. At the foot, a classic slat design is framed by the same graceful arches in the trim and legs - offering an combination of classic and modern that is perfect. To finish off the piece and a rustic touch, four hammered metal straps are mounted to the head and foot board - bringing a beautiful touch to this bed. Customize a Laredo Bed to fit any bedroom by choosing the size, hardwood, and finish combination that will fit your unique decor. Add the nightstand for a place to keep your bedside essentials and a dresser for your clothes to complete a bedroom suite that will keep you in awe for decades to come.